Being the dog lover that I am, one of my favorite shows is The Dog Whisperer with Cesar Millan. Lately, as I have been watching that show for insight into my own dogs (Toby and Daisy, two beagles), I have been amazed at the similarities of raising children well and training dogs well. Let me start off with a disclaimer: I am not suggesting or implying that children are like dogs or should be treated as such. Although, I would hope that is assumed, I want to be sure I am clear that the similarities lie in the interaction and relationship, not with the child and dog. One of the things I hear Cesar repeatedly discuss with dog owners is about the energy that they give off to their animals. Many of the owners believe that they communicate one thing, but the dog receives another message. This is true with children as well. When we present nervous, angry or scared energy in front of our kids, they pick up on those emotions. Even when what we say and do differs from what we are feeling, the energy still conveys. Along the same lines, how we truly feel about our children is received loud and clear, whether we verbally express those feelings or not. As an example, children learn to pick up on non-verbal cues very early. So, when a parent is disappointed in a child, but says “You tried your best”, the child hears “You did not live up to my expectations”, regardless of what words were spoken. Another element to Cesar’s “owner rehabilitation” is that you must give off an energy that communicates strength, respect and confidence. One of the biggest struggles for the dog owners (and parents!) is feeling defeated and giving up. The adult must express to the child that you are in control and are CALM, even if you do not feel that way initially. Over time, you will build confidence in your parenting abilities and will not be “faking” that emotion. In the mean time, you must exude control and comfort with whatever comes. A third component to Cesar’s strategies is teaching owners when to acknowledge what behaviors. When a dog is aggressive, out of control, fearful or shy the owner is to ignore the behavior and continue communicating calm, assertive energy that will not tolerate those behaviors. Dogs, and children, can learn to self-regulate, but often do not because the adult tries to intervene and do it for them. Allow the child to work out their issues, and do not give in to the tantrums, which is reinforcing the unwanted behaviors. Additionally, The Dog Whisperer recommends that you do not acknowledge the dog in a positive manner until the dog is doing a behavior that you want him to. By giving love and affection to the dog during a desired behavior, you are conditioning the dog to expect a reward for good behaviors, thus increasing the frequency of the desired behavior. This is called conditioning. This also works with children, although I have a modification to align this practice with play therapy and a child-centered model. Rather than praising or rewarding the child when he or she makes good choices, take that time to lavish encouragement or affection on the child. When you notice your child playing nicely with a sibling, completing chores or sharing with a friend, extend encouragement (“You are trying hard to make good choices”) and affection (give a hug or special affections saved for significant moments). We can be encouraged and informed from many sources, if we expand our knowledge to other areas of our lives. 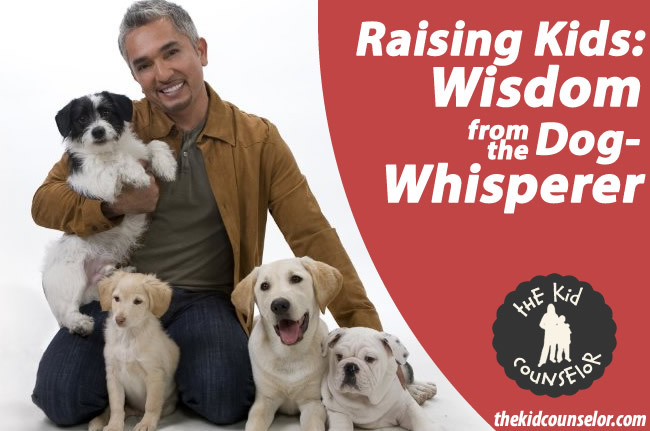 The Dog Whisperer has given me many ideas for interacting with the children that I see. After all, love, respect, and communication are the keys to any relationship…animal or human. Update 11/28/2009: This blog post caused quite a media frenzy! The Kid Counselor ended up on CNN!